Dr. Julie TwoMoon is a Naturopathic Medical Doctor educated at the National College of Naturopathic Medicines, a fully accredited Naturopathic medical school. 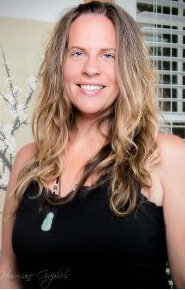 During her six years of medical training, Dr. Julie also received a Masters of Science of Oriental Medicine. Her treatment focus is on nutrition, Chinese herbal medicine, acupuncture, qi gong, toxin elimination, and complete body balancing. From 2003-2006 Dr. Julie practiced with the Michigan Pain Specialists providing comprehensive care to patients of all kinds. In May of 2006, she opened Breathing Waters in Plymouth MI and now, after 6 years in Plymouth is excited and proud to transition to Seven Directions Center for Restorative Medicine. In addition to her Naturopathic and Chinese Medicine focus, Dr. Julie has also studied Jin Jing Gong and Mount Er Mai schools of Qi Gong and continues to practice and teach forms from both schools. As a tireless advocate of clean reliable food, she has great passion for cooking, growing organic fresh food and continually improving how people relate and learn about food and how it affects their health. It is time for new medicine: To emerge into an era where we forego limiting concepts of human potential, where we facilitate healing using tools which strike to the core of our human experience…..our inherent vibration. Where our medicines no longer separate us from the sources of our existence and where disease is understood as what it is: a profound disconnection between our base vibration and the source field which informs us. It is time to heal, it is time to reconnect, it is time for medicine which allows us to experience the fantastic gift of being human! Dr. Julie believes in individualized care, providing constant patient education, attentive listening, results based treatments, and resources for both curing and preventing disease. She never stops educating herself about how the body works, and how it can be improved, applying her philosophy of healing in its totality to her own life and the life of her family. True Healing Takes On Many Forms! Does DNA Have a Sound? Do You Tend To Leave Before The Grand Finale?